The ten year anniversary of Ballard megachurch, Mars Hill, was honored this fall with a piece in the Seattle Post-Intelligencer about its growing regional influence. The article set off an on-line flurry, with defenders pointing out the transformed lives of some church members, while detractors railed about sexism and bigotry. The debaters told two sides of the same story, but was anyone listening to both? If outsiders were listening, what they would hear is that on the inside, it doesn’t feel hateful. The accusations of hate and bigotry simply don’t ring true. When a dogma takes hold of you and shapes your moral priorities, you can do all kinds of things, good or evil, and they can come from a place of love. Encouraging women to pump out “quivers full” of babies, telling gays and Jews they are going to hell, dismissing the moral wisdom of non-believers – these are minor compared to other things that have been done in service to the God of Love. Long ago Spanish Conquistadors baptized native infants and then ran them through with swords. As extreme as this sounds to us today, they may have been feeling pained benevolence, born of certainty that they had no choice when dealing with people they viewed as ‘savages’. The young men who drove planes into the Twin Towers may very well have acted out of love—love of God and love of their fellow Muslims. When we see ourselves as servants of a higher good, and when we pair that attitude of service with certitude, we become capable of the selflessness of Mother Teresa or the horrors of the Inquisition. If we are listening, the Mars Hill members are telling us quite honestly what it feels like to be a fundamentalist. Ex-Moonies, Ex-Scientologists, Ex-Pentecostals, and even garden variety ex-Evangelicals have written about this with thoughtful and sometimes painful candor on FactNet and other websites for “walkaways.” It feels beautiful. It feels like the real deal. It feels like being part of a loving community with a higher calling–because, in fact, it is. Religion scholar Huston Smith says that the world’s great wisdom traditions converge on three virtues: veracity, charity, and humility. Veracity means truth telling and truth seeking, including honest appraisal of our own biases and limitations. Charity means love—valuing the pain and delight of others as you value your own. Humility means seeing yourself as just one among many— recognizing both the limits of your own discernment and the value of theirs. These three virtues provide a good metric to assess an institution like Mars Hill. Where the teachings of religious institutions are in keeping with these three virtues, their leadership inspires acts of generosity and compassion. When these three are violated, leaders and followers in any religion are at risk to do harm to those around them and to inspire not gratitude or respect but hostility born of fear. We should not be surprised that when fundamentalism came to urban Seattle it came wearing hip clothes, playing rock music, and tossing Frisbees. How could it succeed any other way? We also should not be surprised that it evidences some of the very same beauty of spirit that characterizes our region so broadly. This entry was posted in Musings & Rants: Christianity and tagged Calvinism, Mark Driscoll, Mars Hill. Bookmark the permalink. 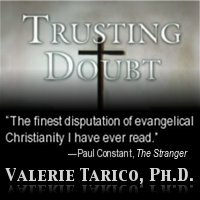 Valerie Says: What I hope, ultimately is that Mark will come to recognize his theology itself as the root of the problem– To understand that a stance of human certitude cannot serve the Ultimate Essence of Goodness and Truth. Without a broader transformation, one leading to the deep humility that values doubt, Mark will continue to speak confidently for God, not know how often it is that, in reality, he puts God’s name on human constructions. Our greatest risk in the quest to serve Goodness is that we forge ahead, blind to our blindness, sanctifying our own conclusions and idolizing the teachings of our spiritual ancestors. We have two powerful protections against this risk. The first is love –the love that sees the Samaritan not as a potential Jew but as a “neighbor”, a human being. The second is doubt, the humility that keeps us constantly aware that we all, from the prophets and apostles to modern day ministers, see the Real through a glass darkly.
. . . someone stated above that Mark needs to realize that his theology is the issue in the first place. Since when has preaching Jesus Christ been the root problem of Christianity? Jesus Christ is the root, the reason and the truth of Christianity, PEROID! I can see one not agreeing with his method, but it seems that some have an issue with the principle of Jesus Christ. What theology would that be? If it’s complementarianism then you’re nuts. Linking complementarianism to abuse of women is like linking egalitarianism to disengaged men who take no responsiblity or interest in their families. What I hope, ultimately is that Mark will come to recognize his attitude toward theology itself as the root of the problem– to understand that a stance of human certitude cannot serve the Ultimate Essence of Goodness and Truth. Without a broader transformation, one leading to the deep humility that values doubt, Mark will continue to speak confidently for God, not know how often it is that, in reality, he puts God’s name on human constructions. Our greatest risk in the quest to serve Goodness is that we forge ahead, — sanctifying our own conclusions and idolizing the teachings of our spiritual ancestors. Sonia, when you equate Mark’s theology with “Jesus Christ,” you are doing the very thing I was trying to describe. The same is true Ryan, when you say that Mark is speaking “The truth.” Mark’s theology, like any of ours is about Jesus dimly perceived through the filter of Paul and through the filter of the Council of Hippo Regis, and through the filter of John Calvin and John Darby and American culture, and a seminary . . . It is also about Truth perceived dimly through those same filters. When we don’t understand our limitations and our filters, then we equate our attitudes with those of God. This is an issue that is both wider and deeper than whatever language one might use to talk about females. Peter: Wives, in the same way be submissive to your husbands so that, if any of them do not believe the word, they may be won over without words by the behavior of their wives, when they see the purity and reverence of your lives. Ephesians: 22Wives, submit to your husbands as to the Lord. 23For the husband is the head of the wife as Christ is the head of the church, his body, of which he is the Savior. 24Now as the church submits to Christ, so also wives should submit to their husbands in everything. 25Husbands, love your wives, just as Christ loved the church and gave himself up for her 26to make her holy, cleansing[b] her by the washing with water through the word, 27and to present her to himself as a radiant church, without stain or wrinkle or any other blemish, but holy and blameless. Rob Says: Valerie, when you are making your human certitude about the errors of Mark being sure of the truth, are you suggesting that what you are saying is just a possibility as there really is no truth that we can be assertive of? I guess if this is true, then it means that you cannot even assertively say what you are saying. You are arguing then just as in the dark as everyone else – unless you are in the dark and have missed that the fact that perhaps another soul has discovered a truth that can bet assertively expressed and you just do not see it. I have not read your work ” The Dark Side: How evangelical teachings corrupt love and truth. ” But even the title suggests that love and truth are humanly ascertained – and the evangelical teachings corrupt these truths. This then means that you agree that there can be certitude from a human standpoint. So I guess the human certitude that you are against is ones that disgagree with your own particular truths that you are certain of. ShariMac Says: Rob: huh? I’m not sure I followed all that. But I think Valerie’s point is that everyone views whatever truth exists through their own filters. When a pastor believes he speaks for God, as if those filters don’t exist, he’s treading in dangerous territory. None of us is God, and we can’t speak for God. People study and do their best to understand and follow God, and come to various understandings of what that means. But in the end, we’re all just making our own best educated guesses. It isn’t that truth doesn’t exist, but that we need to acknowedge the limitations of what human beings can know for sure. And we need to be careful about imposing our understanding of truth on other people and be careful not to threaten them with God’s wrath if they don’t agree. You ask how what I think about two verses. But I cannot consider these two or any verses outside the whole trajectory of scripture. I cannot consider them without regard to who wrote those verses and why, who decided that a specific fragment of writings to be a part of the Bible and why, or what rationales are used currently to emphasize different parts of scripture and to downplay others. All of these are human decisions. That is all I’m trying to say. I keep saying it, or at least struggling to find the right words, because it when we don’t recognizing these as human decisions, we mistake human creations for manifestations of God. That is idolatry. And it puts us at risk of violating the deepest values of Christianity itself, the heart of the ministry that is described in the Gospels, and the moral core that Christianity shares with many of the world’s great wisdom traditions. Human history and Christian history are fraught with errors of this type made by people who earnestly sought to do God’s will. If we ignore the layers and layers of human judgments that lie between us and the ultimate realities we are trying to understand, then verses such as the ones you quote not only seem clear, but seem to be a clear statement of the will of God. If we do look at the layers of human decisions that have brought those specific verses in that specific English form to your attention, then we realize how humble we must actually be about asserting that we are absolutely sure what is right. Sharimac said it better than I have. Thank you, Sharimac. I question the authority of 20th century Christians to overturn the faith once handed down from the saints. Here are some more specific thoughts. There is an actual field called text criticism that deals with the accuracy of the current with the original texts so we can be confident that the scripture we have is an accurate rendering of the original in all major doctrines (though text criticism does not deal with authorship). I certainly agree that the trajectory of scripture is important, but I don’t think that trajectory alters those texts. This leaves only a few possible reasons for discounting these verses that you mentioned. You don’t trust the original author (2) You think they should never have been included in scripture (3) You think other portions of scripture contradict these (or offer a better interpretation). Either of the first two puts your subjective opinion (or the opinion of modern scholars) in a superior position to the early church that formed the Bible and the 2000 years of church history that have taken them as sacred scripture. It seems excessively prideful that the modern church would assert that Christ has allowed his bride to be misled for 2000 years. The third is possibly viable, but I think one of the primary rules of biblical interpretation is to interpret unclear passages in light of clear ones. “Neither Jew nor Greek” is certainly clear concerning the equality of all Christians as children of God, but it is not clearly an applicable church government or marital relations passage, whereas the passages it is usually used to overturn are very clear and unambiguous in their prescriptions for both marriage and the church. Valerie Says: Hmm, Robin. Which body of believers is the bride that God has kept from error for the last two thousand years? Robin Rhea Says: Valerie, I was referring to the fact that I think the Bible we have is God’s word, so the believers I am referring to would be the ones which have believed that the Bible we have is God’s word, which includes all of the historical church with only a handful of exceptions (The gnostics in the first several centuries) Even though Catholic have the Apocrypha now, they only held the Protestant 66 books as scripture until the Council of Trent in the counter-reformation. Rob Says: Clearly there will be continued disagreement on this gender roles issue. We can be one in Christ as Christians and not come to agreement on this issue. We can show love to other Christians that value the Scripture but interpret it differently. Clearly all parties agree that man and women are of equal value in God’s eyes. Clearly only women can be mothers and only men can be fathers. Other roles differences are acknowledged by some and denied by others. Many of us have read the pros and cons of the arguments and despite Christians who claim to hold a high view of Scripture (unlike Valerie- it seems – and others) arguing for the egalitarian perspective there are many, like myself, that are convinced that the Scriptures teach c complimentary view. It is rather pointless to argue the matter with people who do not agree that the Scriptures are the final authority in the matter. Neither party will convince the other. I have a lot more tolerance for Christians who disagree me on Evangelical egalitarianism versus comlimentarianism than I do for those that argue for abortion, fornication, homosexuality and other sins. Robin – When you say that the Apocrypha were not affirmed as scripture until the Council of Trent, I learn that you are getting your history from scholars who are apologists for a specific point of view. The same is true when you lay out your heuristic for interpreting scripture. In other words, your information about the Bible and the will of God is filtered through a vast set of human judgments. Can’t you see that your statements illustrate what I am trying to communicate? When your preferred history and heuristic are accepted, yes they do lead to a certain range of possible conclusions. But the conclusions you have reached are not inevitable. And to attribute them to God is idolatry. Idol worship is simply giving divine attributes and sacred devotion to a human construction, whether that construction is a gold statue, a book, or a rule for living. To deny the fallible human decision making processes that lead to your conclusions is not only false, it is dangerous. History is fraught with atrocities committed by people who embraced a clarity reached through serial human judgment calls and then treated that clarity as a divine mandate. And Rob – You demonstrate the very attitude that leads to this kind of error. Essentially, you are saying, "We can talk with people who disagree with us, but only within certain bounds set by the doctrines that nobody is allowed to question. Her view of the Bible is too low – or her Cristology is too low, or maybe both are quite high, but she doesn’t agree with me on the sacred status of a blastocyte or how best to interpret those verses about homosexuality and other abominations. Therefore, EOC (end of conversation)." But you are the one making those decisions, deciding which conversations are of interest and which are not, which information is relevant and which isn’t, which experts are credible and which are not. And these decisions are visibly influenced by a confirmatory bias that we all fall prey to unless we vigilantly guard against it: we seek information that supports what we already believe. Real truth-seeking demands the opposite. It demands that we start with the data rather than the conclusion. And it demands that we ask the questions that could show us wrong. I am indeed intrigued with your thoughts on the resurgence of fundamentalism in churchhistory as a school of (or lack of) thought. Although I subscribe to neither the higher Germancriticism of the 19th century or the rigid almost Islamic model that has wide currency in evangelicalcircles today , I am still open to free inquiry. I have always been a free thinker of sorts, and in lesstolerant times would most certainly have wound up pole bound atop pitched faggots. Suffice it tosay , I’m a mixed bag when it comes to theology and its relationship to the behavioral sciences.H. And how is it revealed (the) (an) Ultimate Essence of Goodness and Truth is there to be served? I’m new here, and just looking around and this caught my eye. I’ll try again; And how is it revealed (the) (an) Ultimate Essence of Goodness and Truth is there to be served? Valerie Says: Let me try again, and see if I can say it maybe more accurately: What I hope, ultimately is that Mark will come to recognize his attitude toward theology itself as the root of the problem– to understand that a stance of human certitude cannot serve the Ultimate Essence of Goodness and Truth.